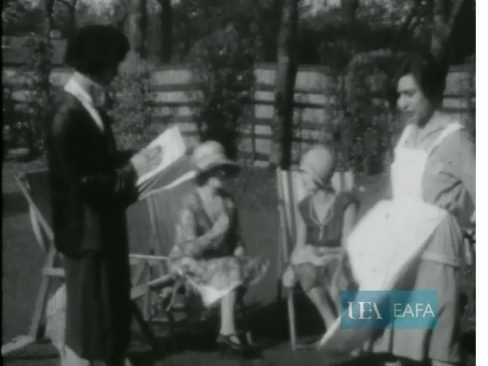 Since 2015, the Women Amateur Filmmakers in Britain project has uncovered and digitised over 100 films made by women amateurs between 1928 and 1988, to identify and celebrate the historical role that such women pioneers played in the British amateur film movement. Tonight, the WAF project presents three of the earliest silent films in its collection, with new soundtracks composed by Laura Rossi, and performed by Laura Rossi (Piano), Mike Outram (Electric Guitar), Trish Clowes (Tenor and Soprano Saxophone), Hugh Wilkinson (Tuned Percussion). Sally Sallies Forth (1928), directed by Frances Lascot : heralded as the first amateur film produced entirely by women. Chaos ensues when Sally (Sadie Andrews) becomes a maid for a day at an upper class garden party. The Polite Burglar (1929), directed by Sadie Andrews : a comedy produced as a competition for the London Amateur Cinematographers Association – can you spot the 30 deliberate errors in the film? Doomsday (1932), directed by Ruth Stuart : an early amateur science fiction film about the end of the world, strongly influenced by European art cinema. The programme will also include a Q&A with members of the WAF project team, the East Anglian Film Archive, and a member of the Institute of Amateur Cinematographers. This event is supported by the University of East Anglia, the East Anglian Film Archive, the Institute of Amateur Cinematographers, the John & Joy Chittock Trust, and the ESRC Impact Accelerator Award.